The modern city of Düsseldorf situated on the Rhein, is home to the famous tram manufacturing company of Duewag. Their trams are very much in evidence here and can be seen in this video programme. Early Düwag AM8 trams dating from the mid 1960’s were still running in service when our cameras visited in May 2010. Many new Duewag Stadtbahn low floor trams are much in evidence, sporting a silver livery in contrast to the traditional red and cream of the older vehicles. In 2010 there is still plenty of street running, but this will soon change as a number of lines are to be put into subways. You will also see inter-urban trams running to Krefeld and Duisburg. A fleet name of Rheinbahn is used on the Düsseldorf trams. Filming locations include Heinrich and Kasernen Strasse, Graf Adolf Platz and the Hauptbahnhof. There is plenty of action for you to enjoy. From the hustle and bustle of Düsseldorf we move further north to Bielefeld, a quieter modern town situated between the Ruhr and Hannover. With its metre-gauge tramway our cameras observe the tram movements at the tram station on Nieder Wall and nearby N. Dürkopp Strasse. The Bielefeld system uses high-floor trams with high platforms at most stops. The fleet is made up of Stadtbahn style cars manufactured by Duewag and a number of them are in all over advert liveries. Look out for the works car converted from an earlier Düwag tram. Our third visit on this programme is to Hannover, a largely rebuilt city after the war, noted for its Trade Fairs. It too has Stadtbahn high floor cars with most of the central running in subways, apart from route 10 to Ahlem which uses traditional track. We take a ride on this service to locations such as Glocksee and Goetheplatz to record the services there. Other filming locations include the Hauptbahnhof, Dragonerstrasse and Bütnerstrasse. Our final visit on this programme is to Krefeld, a modern industrial town north-west of Düsseldorf. 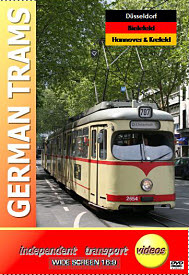 It is served by a 37.3km metre-gauge tram system, and is also linked to the regional city by the Rheinbahn standard-gauge light rail line resulting in some dual gauge track in the central area. A fleet of Düwag and Duewag articulated trams provide the metre gauge service; the interurban trams that we have observed earlier in this programme in Düsseldorf are also recorded. This very smart fleet trams are filmed at the Hauptbahnhof and along Ostwall. The early Düwag cars filmed on our visit left the system in August 2010 and moved to Sofia in Bulgaria. If you are a fan of German trams this video is a must for your collection, and follows on from our previous five programmes on the subject.